In December the WalkBikeJersey Blog posted an article about a proposal to build a bike route on the south side of Ocean City. The goal of the study is to look at options to extend the Haven Avenue Bicycle Boulevard to the South end of the Island to the shared use path at Corson's Inlet. One part of the study is looking at the feasibility and environmental impacts of converting of the abandoned Seashore Line railbed to a shared-use path. The railbed is located on a raised causeway through the wetland area on the bay side of town. The second part of the study will look at options for the best on-road route on one of the three parallel streets - West, Asbury and Central Avenues. A group called Friends of the Wetlands (FOTW) is seeking to stop the $87,000 Concept Development study. Earlier this month the group staged a protest of the study. The group is vehemently opposed to the shared use path alternative and are getting the word out through the press. There are unconfirmed reports that the state bike ped office is receiving more than 30 emails a day opposing the study. It is not known if FOTW has ever conducted a similar campaign against the wetland impacts created by the construction of the new Route 52 Causeway. Oddly enough the study if completed could be FOTW's best weapon to keep the issue from arising again. In a quote from an article in the Ocean City Gazette - "Sam Lavner of Ocean City, an advisor to FOTW, called the bike path 'the zombie issue that keeps haunting the town. It’s been brought back to life twice, but it refuses to die.'" As long as there is no hard proof that a trail cannot be built visionaries will continue to see a stunning bikeway there. It should be noted there is no money set aside to actually build anything , Ocean City will have to seek funding for design and construction. The design process will trigger more opportunities for input and a full environmental review of the project will be required. FOTW's spokesperson Irene Lorenzon has spoken favorably about most talked about alternative route in the study - West Avenue. This would involve taking away at least one traffic lane and creating a two way cycletrack on the west side of West between street parking and the curb. It's a great option that will also improve pedestrian safety and calm traffic albeit less scenic. While it is very likely that some FOTW members are genuinely concerned about the impacts others may be simply using the group's platform to oppose a trail they can see from their backyard. One writer noted in his letter that "...residents in the area whose property values and privacy would be threatened have opposed such projects". That is a common NIMBY argument for any shared use path and a possible signal of the reaction to a West Ave alternative. Opposition to the West Ave Cycle Track may be much broader. Not every Shore resident is environmentally sensitive but most of them are very sensitive to perceived traffic impacts. Furthermore NJ DOT traffic engineers have traditionally been very reluctant to reduce lanes to accommodate bicycles especially on arterial roads. Bicyclists who want to see the shared use path option given a fair shake need to speak up. Ocean City deserves credit for not caving in to local opposition. But ultimately without the public support for the trail opponents will win. Anyone who contributes to the economic health of Ocean City from full time residents to day trippers need to contact Ocean City's elected officials. You can conveniently contact them here. I bike down to Ocean City at least twice every summer from Atlantic City with my wife. Sometimes we go much further. We take the train from philly with our bikes and get off at the convention center. Ocean City is the least of your problems as a biker down at the shore. Why not work on Atlantic City vicinity. You have to risk your life to cross the bridge to Brigantine. 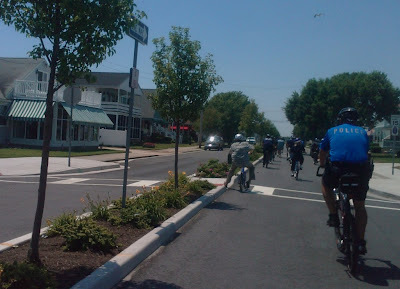 Besides isn't there already bike lanes in Ocean City? I don't want to hold up progress with the future of bicycling and infrastructure in America but I think there are bigger fish to fry in New Jersey than to go piss off the FOTW. Just my two cents from Philly. Good luck Jersey.